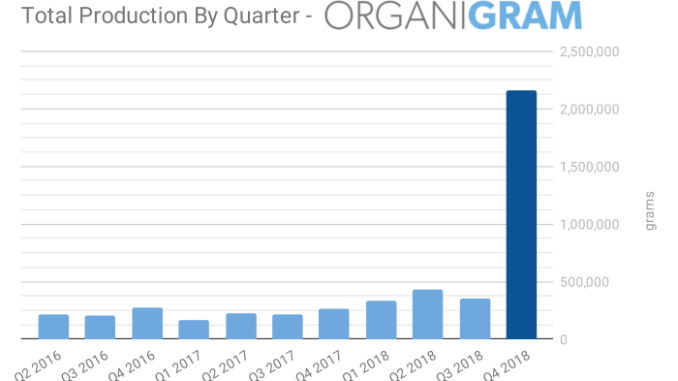 Organigram (TSX.V:OGI) became the second major cutlivator to release earnings in the era of legal recreation cannabis in Canada this past Monday, showing us what a gimmick-free, well-focused company is capable of turning out in this cannabis landscape. OGI delivered 515% growth in unit sales over the previous quarter on the strength of strong rec market sales, fed by a successfully built out and streamlined Moncton, NB facility. 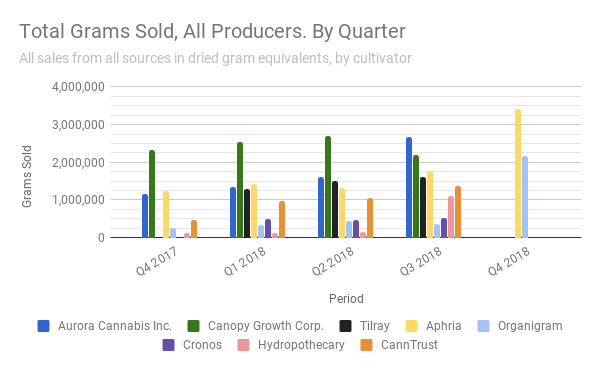 In recognition of a very successful first rec quarter at OGI, Fundamental Hype presents a special data-based look at the ongoing rise of a premier cultivator. In the early days of the ACMPR, Organigram was a small, underdeveloped also-ran who couldn’t figure out how to get their product to patients without pesticides in it. OGI and Hydropothecary (now HEXO Corp. (TSX:HEXO)) were the subjects of the first large scale Health Canada recalls. But, as they say in the self help books, it’s not how hard you get dropped, it’s whether or not you can peel yourself up off the mat and keep punching. CEO Greg Engel came aboard in March of 2017, and when we spoke with him this past summer, it was clear that he was approaching his new company like a turnaround job. At the time, we were still trying to get to the bottom of who was actually growing the dope that went to market. A great deal of unreported outsourcing was throwing off our facility efficiency metrics, and we wanted answers. Engel was one of few cannabis co. executives who had some, and he delivered them with patience. The units that OGI had wholesaled while his predecessor was CEO at had been reported and accounted for. OGI didn’t do that anymore. They grew all their own product. He had a good five or ten minutes worth of material on the facility that they were building, the techniques they were using there, the high hopes he had for the expansion, etc. As their peers were busy buying foreign operations and setting up global supply chains, signing LOIs with pharmaceutical distributors in various parts of Europe and Scandinavia, becoming the official cannabis supplier to the Kingdom of Lesotho, or doing paper deals for each other, OGI kept their head down and built their rooms. For a year, OGI’s investor messaging has been all about getting their flagship facility right. Every press release carried on the company’s investor page for the past year has to do with facility construction and expansion. The company made investments in a German distributor and in the company that supplies them with hemp-derived CBDs, but there were no splashy deals for foreign subs or research deals with beverage companies. It was all about tuning the operations. Putting themselves in a position to make it count. OGI moved two million grams for their first time ever, breaking into the top four with a bullet. They’re still a million short of Aphria Inc. (TSX:APHA)(NYSE:APHA) this period, but 2.16 million grams would have been a hair shy of Canopy Growth Corp. (TSX:WEED)(NYSE:CGC)’s 2.19 million units number last quarter. 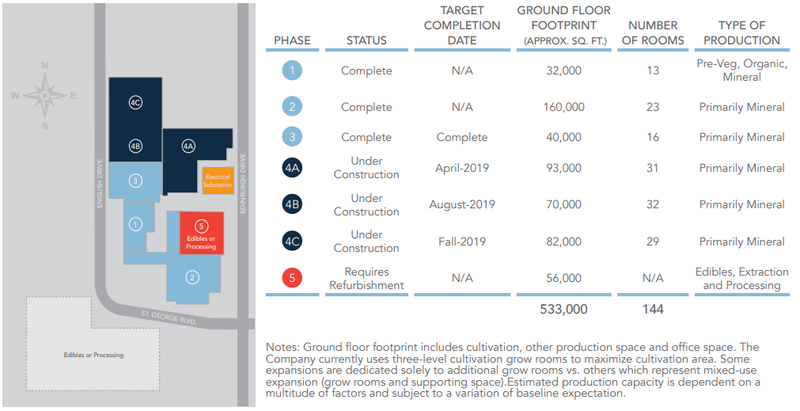 Aurora Cannabis (TSX:ACB)(NYSE:ACB) is next to report, and with their 800,000 square foot “Aurora Sky” facility having come on line that quarter, they’ll have nearly twice the production space, and a much higher expectation multiple. We noted in the January edition of our war for shelf space series that Organigram had aggressively increased the number of SKUs available in our sample since the previous count. 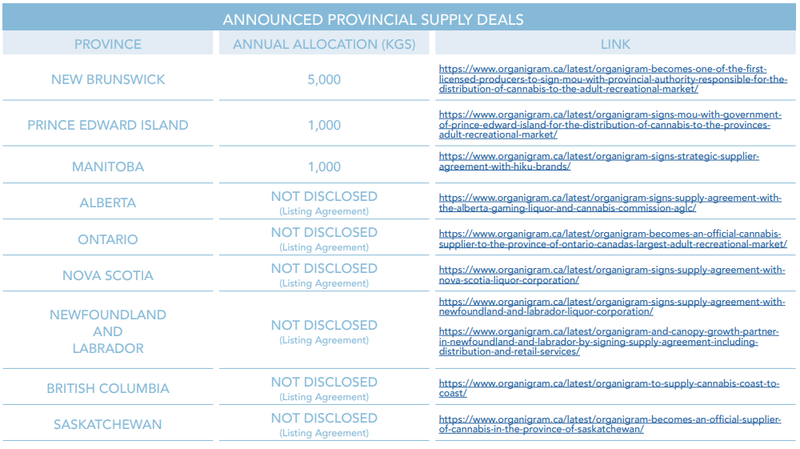 OGI saw the largest expansion in in-stock products, quarter over quarter, at sampled provincial dispensaries. 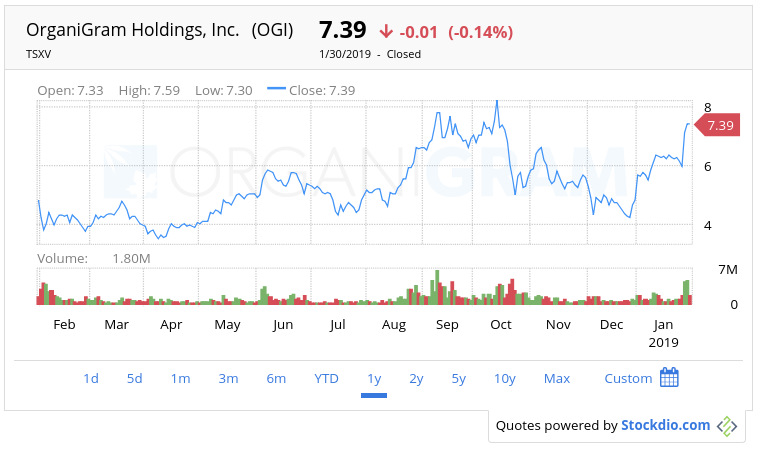 OGI sold its interest in a line of clinics called Trauma Healing Centers to VIVO Cannabis (TSX.V:VIVO) this past quarter, preferring to focus on the rec market. Aphria told us on their call that they hadn’t seen any cannibalization of their medical business from the retail business quite yet. If the markets are indeed developing in isolation, OGI’s medical business may yet develop and represent an opportunity on top of retail. Presently, the government is leveling the same excise tax on medical cannabis that it does on retail cannabis. LPs (including OGI & APH) have been covering that tax to stay competitive, and have been vocal about the immoralities of taxing medicine. If, in fact, the government ends a tax on medical cannabis in a developed retail market, OGI may wish they kept those clinics. In the meantime, there’s a lot to like about the retail market. OGI has a brand-focused retail strategy that their marketing people could probably tell you more about than we can. Handy branded chart of the brands that make up OGI’s retail operations. If anybody can explain what kind “Niche Equity” is, or what makes it a “tangible brand attribute,” please let us know in the comments. 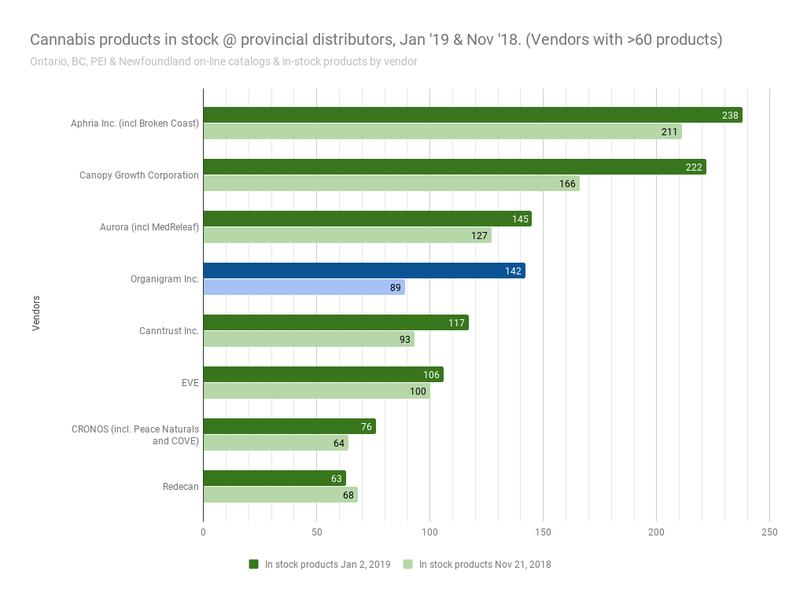 A hot start for the brands bodes well for the fulfillment and eventual renewal of supply contracts with provincial governments, a cornerstone to the OGI strategy. Supply contracts graph clipped from the OGI MD&A. Check the original for the live links. All that for twelve million bucks? We’re still wrapping our head around companies that trade at 20x and 30x sales multiples. And $12.4 million doesn’t sound like a lot of quarterly revenue. But it’s important to remember why we’re in the room: these are growth assets. Investors are betting on them scaling to displace the centuries old market of guys on bicycles. And when it’s scalability you’re after, there’s nothing like already having the margin. On a straight line accounting basis, Organigram sold their product for 71% more than they bought it for last quarter. Aphria’s gross came in around 30%, but management on the Aph call stressed that it had to do with cultivation windows and the retail scale-up. Aph’s management is right: it makes more sense to evaluate margin over a 12 month period than a 3 month period, but 71% is a fine number that’s going to be hard to beat over any period. 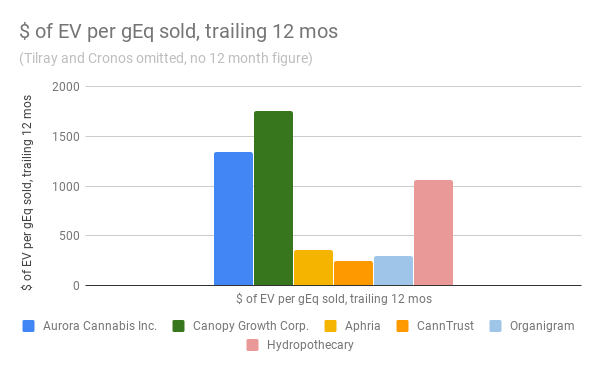 This chart divides the enterprise value (basically market cap without the cash) of some of the more popular cultivators by their unit sales in the past 12 months. The chart makes Organigram, Canntrust (TSX:TRST), and post-short-attack Aphria look cheap for investors looking for exposure to production. In some sense, Canopy and Aurora, with the biggest footprints and the biggest buildouts, have a lot to live up to. We’ve been playing with the biological assets metrics for a while, hoping to find a look at the size of cultivator operations, maybe a leading indicator. This is the book value of Organigram’s biological assets plotted against their unit sales (log scale for comparison purposes). 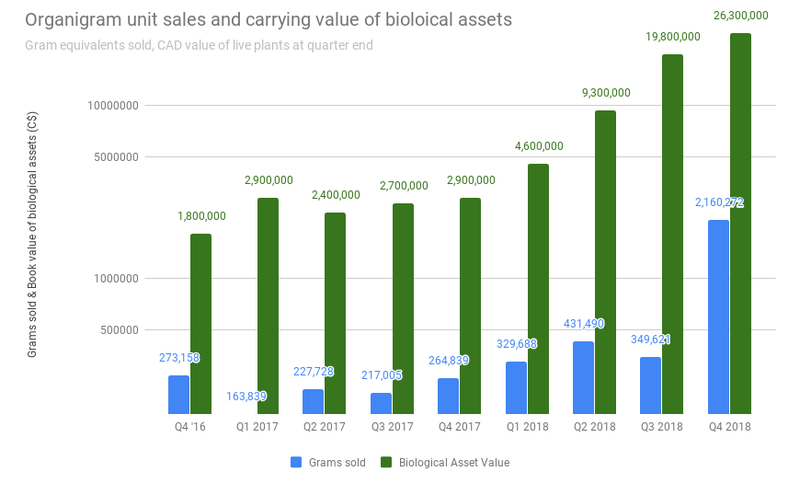 Biological assets isn’t an exact science, and this would be a more complete look if it included inventory, but the plant value going up in the two quarters ahead of the sales bump is worth noting. It’s up again this quarter. Above: chart drawn on the day we published this post. Below: a live chart.